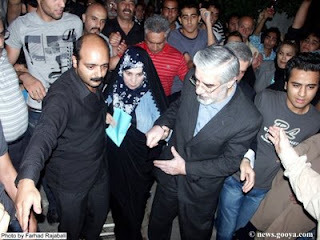 A heartwarming gesture by Mir Hossein Moussavi and his wife, Zahra Rahnavard, who paid a visit to Sohrab's family today. Don't ever let these ultimate sacrifices by the people of Iran be wasted. Victory to the noble people of Iran in their battle against the savage beasts. I think Mousavi is inept and a bit scared to push this. The people crossed him on that bloody Saturday. Mousavi is part of the problem not part of the solution to Iran's ills. Iran will be free when all the akhounds and nokaran-e-akhound renounce their past crimes and leave the country. Mousavi is part and parcel of this crminal clique. He may have changed his mind now that he understands the depth of teh crimes of the Islamic republic that he once championed.